On 24th August 2006 Dave Pickett sadly passed away leaving his loving wife Dawn and his two wonderful children Alex and Jack behind. He was one of my patients at Emmanuel House and had been bravely battling with Oesphogeal Cancer. Although I only got to know Dave for the last few months of his life he was a great guy who always had a smile on his face and was an inspiration to many others. Dave was loved and well known by many people. They all helped out and together raised the fantastic sum of £4,500 for Emmanuel House, donated in his memory by his family, friends and work colleagues. We were truly blessed to receive such a kind donation at such a difficult time. Because so much money was donated to Emmanuel House in memory of Dave Pickett I felt the need to do something special with it. So in 2008, on his son Jack’s third birthday, we opened a Summer House for children of all ages and equipped it with everything that they would need from table football, keyboard, boys workbench, dolls house, games and much more. I somehow felt that Dave would have wanted me to provide a place for the children where they could have their own fun time whilst their parents would come and relax, have therapy or just a simple chat with others. On the opening of the Summer House Dawn Pickett said “it was a really emotional day but a happy one as well”. Since Dave’s passing ten years ago we have never lost contact with Dawn and the family and they have been great supporters of Emmanuel House throughout the years. 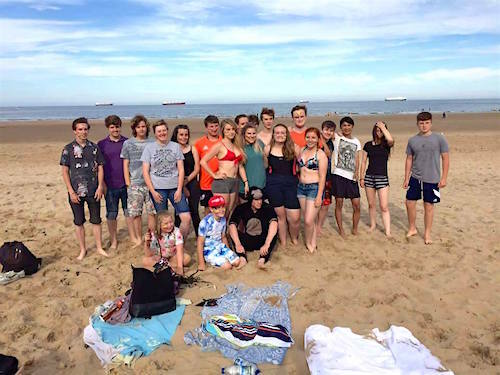 In August Alex held a beach party in memory of her father to help raise funds for Emmanuel House. You can read more here on her JustGiving page here. It was the ten year anniversary for her dad, and she wanted to celebrate his life. 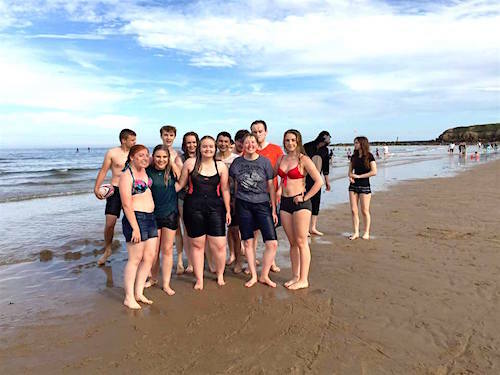 She organised a party on Tynemouth Beach for friends and family. 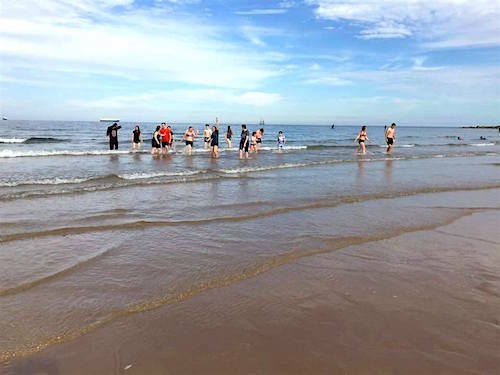 There was even a sponsored dip in the sea to help raise funds. Between the JustGiving page and donations on the day they raised £300 in total and we are extremely proud of Alex, she really is a truly amazing young woman. “It was a fantastic day and it was amazing to have the support of all my family and friends.” Alex said. “I’m glad I could give something back to Christine and Emmanuel House as they have helped our family so much, and my Dad adored Christine and Ray”. She is an inspiration and regularly fundraises in memory of her Dad. We are so blessed to know people like Alex, who help us do what we do. Without fundraising we simply would not be able to help people the way we do. We have three holiday homes situated at Cragside Caravan Park in Eastgate near Stanhope in Weardale. They are available free of charge for cancer patients, the terminally ill and their families to go to for respite care. It cost £7,000 per year to keep our holiday homes up and running, so we’re always grateful for any help. If you would like to learn more about what we do, click here.